This is the catalog cover for the 2006 catalog for the Prairie and Wetland Center in Belton, MO. The primary focus is native plants. These postcards were created for Campbell Enterprises in Rossville, KS to promote two different divisions of their company. This postcard is used to promote a weekly action program, www.Elite-Force.org, for boys as well as the related summer day camp, www.CampHighAdventure.org. This is a point of sale piece we designed for Van Zyverden for use in Home Depot garden centers. This trifold brochure was designed for Portsmouth Christian Academy in Dover, NH as part of an integrated fundraising program. This print ad was used by the Western Pennsylvania franchisee to promote both instore and online sales. The "It doesn't have to be painful" message was also used in a related direct mail postcard. In order to implement tokeniztion, you will need to use Authorize.net as your Gateway. 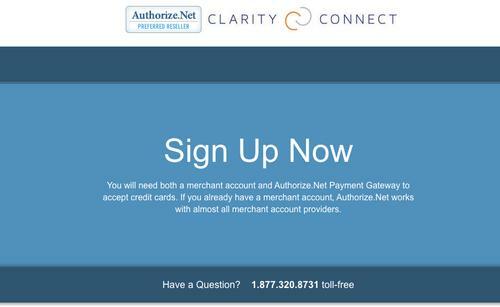 If you already have a merchant account, you can proceed with utilizing Authorize.net for the gateway only. Once your Authorize account is set up, you will need to login and enter in your Merchant ID (MID) and Terminal ID (ID) for your existing merchant account. That is what allows the funds to be deposited into your existing bank account. If you need a merchant account, you can use one of your choice. If you don't have a preference, we recommend Atlantic Merchant Services, atlanticmerchant.com. Our contact there is Scott Chappell, (919) 851-9799. Be sure to mention Clarity Connect as they then look at your account in context of all of the Clarity customers who use their services. This tends to get our customers better rates than they would otherwise. Even if you have an existing processor, you might want to have Scott give you a quote to see if he can save you some money.